We take steps to ensure that you are able to afford the quality care that you deserve. We accept Medicare and HUSKY Health (Medicaid) as well as many commercial health insurance plans. With insurance, the charges for your visit are based upon many factors, such as services provided, your insurance status, your insurance policy’s benefits, deductibles, co-pays or co-insurance fees. We recommend that you review your health insurance plan booklet or call your insurance company representative before you visit, to make sure you understand your specific policy benefits and provider network requirements. It’s important to know who you have chosen as your Primary Care Physician, and to update that if necessary before your appointment. Failure to follow your plan requirements may result in greater out-of-pocket expenses for you, so it’s really important to stay up-to-date with your insurance company’s policies. If you do not have insurance, or you’re underinsured (your insurance doesn’t cover everything you need it to), CHC offers a Sliding Fee Discount program, which provides reduced rates for those who quality. If you qualify, visit fees will be based on a sliding scale using income and household size. If you have concerns about paying for your prescriptions, we have a Pharmacy Assistance Program that may be able to help. Please talk to your provider about your concerns, and they can connect you with that program. As a Federally Qualified Health Center (FQHC), CHC offers discounts based on income in accordance with federal poverty guidelines and household size. 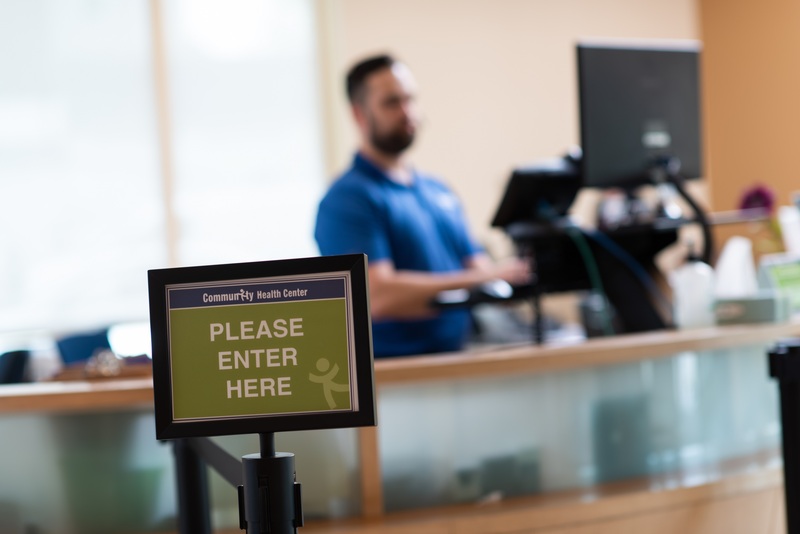 Our on-site Patient Services Associates (PSAs), the Patient Accounts/Billing Department, and our Access to Care (ATC) team can help determine if you qualify. You can qualify even if you are insured. Please note that Sliding Scale Fee is not insurance, and qualifying for Sliding Scale Fee at CHC only covers services accessed at CHC. Complete the Application Here. Be sure to provide information for all your household members. Bring the application and one of the following documents to any of our locations, or mail it to us at the address below. This documentation is a required part of the application process and demonstrates proof of income for all of your income sources. You will be charged full rate for visits until documentation is provided. If you do not have any written proof of income, you can submit a self-declaration of income letter. If you have insurance, please make sure you bring your insurance card with you to every appointment. You must pay your copay at each visit. Patients are responsible for paying any unpaid balance for services. This includes the sliding scale fee, co-pays, co-insurance, deductibles, and other services not covered by insurance. If you’re unable to pay your account balance, we offer payment plans. Please contact our Patient Accounts/Billing Department at 888-270-6698 for more information. Walk in: At every site at the front desk or when checking in at a kiosk. On the phone: 888-270-6698 or 860-347-6971 option 6, (extension 4111). Our Patient Account Representatives are available from 8am to 5pm, Monday through Friday. On the phone: 888-270-6698 or 860-347-6971 option 6, or extension 4111 Our Patient Account Representatives are available from 8am to 5pm, Monday through Friday. How much do I owe for my appointment? You should receive an account statement in the mail. Your statement will reflect any unpaid balances on your account. Questions about your account may be may be directed to Patient Accounts at 888-270-6698 or 860-347-6971 option 6, (extension 4111), M-F 8am-5pm. I don’t have insurance/I lost my insurance. Can I still come to CHC? Yes! We offer a Sliding Fee Discount Program which provides reduced rates for those who qualify. If you are uninsured, our Access to Care team can help you determine your eligibility for insurance and help you apply. I forgot to give someone my insurance information during my appointment. What do I do? You should call Patient Accounts at 888-270-6698 or 860-347-6971 option 6, (extension 4111) as soon as possible. In order to prevent the denial of your visit or other issues filing the claim with your insurance plan, it is important that you contact us immediately. I’m privately insured. Can I come to CHC? CHC uses a Sliding Fee Discount Program which provides reduced rates for those who qualify. If you’re a new patient, please give us a call at (860) 347-6971. We also offer payment plans – please contact our Patient Accounts/Billing Department at 888-270-6698 for more information. Was my correct insurance billed? Questions about your account may be may be directed to Patient Accounts at 888-270-6698 or 860-347-6971 option 6, (extension 4111), M-F 8am-5pm. We accept Medicaid, Medicare, and many commercial insurance plans. Please see this page and contact our office [#] and we can help answer your question more specifically. A co-payment or “co-pay” is a set amount paid at the time of each visit. The amount is set by your insurance policy. You as a patient should be aware of the required co-payment amounts prior to your visit. You can call your insurance company for further details, the number should be on the back on your insurance card. Deductibles are a set yearly amount that you must pay before your insurance benefits begin. For example, if a patient’s policy contains a $500 deductible, the patient must accumulate and pay $500 out of pocket before their insurance carrier will pay benefits. Once the patient has met their deductible, the insurance usually pays a percentage of the bill. Patients are responsible for the unpaid percentage. Co-insurance is a form of cost-sharing. After your deductible has been met, the insurance plan will begin paying a percentage of your bills. The remaining amount, known as co-insurance, is the portion due by the patient. We accept cash, checks, money orders, and all major credit cards, including HSA cards. As a courtesy to our patients, CHC will bill the insurance company directly, if we are participating with your company. Patients are ultimately responsible to make sure that their bill is paid. You are sent notices called Explanation of Benefits from your insurance company that explain what services were paid, denied and what will be your responsibility. If a balance remains after your insurance has issued a payment or a denial, payment is due upon receipt of your statement. If your account is not paid in full or you do not have a payment plan, your account may be reviewed for further collections action from a third party. Why didn’t my insurance pay? You should have received an Explanation of Benefits (EOB) from your insurance company in the mail, showing how they paid or denied your claim. This EOB should have a contact telephone number or web site where you can reach your insurance company for questions. Please contact your insurance company or benefits office with questions about denied claims. Will you bill my primary and secondary insurance? You will need to provide us with complete primary and secondary insurance information. As a courtesy to our patients, CHC submits bills to your insurance. However, it may become necessary for you to contact your insurance company or supply additional information to them for claims processing requirements or to expedite payment. Our Patient Accounts/Billing team is available to answer questions Monday-Friday from 9AM-5PM EST. If you have a question that isn’t answered here, please reach out.